Hello, everyone, and thanks for joining us for this week’s unSeminary podcast. Today we have Phil Taylor from Mosaic Church in central Florida on the show. Mosaic Church started on Easter 2003 and currently has three locations. Being in the backyard of Disney World, Mosaic serves a lot of people involved in the entertainment and theme park industry and so that culture is one of their biggest focuses. Phil is the executive pastor of leadership and development at Mosaic. He spends half of his time at Mosaic developing people into leaders within the church and the other half working on the next project the church is building toward. Phil talks with us today about the key role of the executive pastor and how to support the vision passed on to you from the top. Internalize the idea. // When he was first out of seminary, Phil became a lead pastor. It wasn’t long however before he realized that his calling was better suited toward a second chair role rather than the lead chair. He felt that God had given him the skills to assist lead pastors who have the ideas and vision, but not the organizational skills necessary to bring vision into reality. So in the executive pastor role, Phil takes the vision of the lead pastor and internalizes it so it becomes his own. In doing so, Phil is able to explain and uphold the vision as well as the creator so that he can support and execute on it while working with the rest of the staff. Communication is vital. // The lead pastor and executive pastor need to fully trust each other and communicate often. “If the lead pastor walks into a room of thirty people and says he has this big idea, but it’s the first time the executive pastor is hearing about it, then you have a major problem between the lead pastor and the executive pastor,” Phil says. Phil and his lead pastor meet each week for at least an hour. During that time, Phil asks what God is speaking to his lead pastor and what ideas he has. They then talk about those visions and whether they can do them now, later, or whether the idea would work at all. By the time the idea is presented to the rest of the team, the lead pastor and executive pastor should have already talked about it several times and the executive pastor has some ideas on how to achieve it. Build trust. // As Phil says with a laugh, “You can turn to any marriage book and find tips on how to build trust—that works between the lead pastor and executive pastor too.” Trust is another vital part of the relationship between these two roles. Phil is open and honest with his lead pastor. They talk about their lives outside of the church and he and his wife go on double dates with the lead pastor and his wife. Phil also suggest keeping a list of things that need to be discussed with your lead pastor. It may be things they need to talk about extensively or it may just be updates on projects or problems within the church. That keeps the lead pastor in the loop on everything happening within the church so that he isn’t caught off guard if a staff person or church member brings up a certain topic with him. You can learn more about Mosaic Church at their website thisismosaic.org. You can reach Phil at [email protected] and his website backstagepastors.org where you can learn more about his book series for executive pastors The Backstage Pastor. 00:35 // Rich introduces Phil Taylor and welcomes him to the show. 01:04 // Phil introduces us to Mosaic Church. 02:33 // Phil details his job role. 04:43 // Phil gives us an example of how he brings vision into reality. 08:18 // Phil talks about the Lead Pastor/Executive Pastor role. 12:33 // Phil talks about the important of building trust between the Lead Pastor and the Executive Pastor. 16:20 // Phil talks about effective hiring. 19:58 // Phil and Rich discuss hiring internally versus externally. 22:25 // Phil talks about The Backstage Pastors Series. Rich – Well hey everybody, welcome to the unSeminary podcast. My name’s Rich, the host here and we’re just so honored that you would take some time out from your week, we know that you’ve got a lot going on at your church as we head into this weekend and I’m just honored that you would take some time out to be with us. Today we’re in for a real treat, we’ve got Phil Taylor with us from Mosaic Church in Central Florida. Mosaic is a fantastic church, if you haven’t had a chance to check them out you should, they’ve been around since about 2003, they started in Easter 2003. Our church started on Easter, so did Mosaic. They’re currently three locations in Central Florida. Phil, welcome to the show. Phil – Thanks, great to be here Rich. Rich – Yeah, Phil why don’t you tell us a little bit about Mosaic, give us kind of the sense of what people would expect from the church and then your role there. Phil – Yeah sure. Well we are in the backyard of Disney World, so that’s kind of the dominant focus of the whole area here. You’ve got 55 million tourists a year coming to the Orlando area, you’ve got Disney World alone, 74 thousand people that work there. So we serve a lot of people that are in the entertainment industry, in the theme park industry, in the hospitality industry and that really kind of pervades our culture here, which makes it kind of an interesting place, because you’ve got people moving here from all of the place. No one that lives in Orlando is from Orlando, the first question you ask is, “Where are you from?” because the assumption is you’re not from here. Phil – Which makes it kind of an interesting place, because it’s sort of the place where people are picking up from all over the country or world and saying, “I’m going to go and move to Orlando.” So it kind of has a little bit of a modern day west kind of a feel to it, which is a lot of fun. Mosaic Church is in three locations, one of our locations is actually at Disney World, we have a location in Disney property in what’s called the Downtown Disney or now Disney Springs Area and we have a campus pastor there and then we have two other more suburban campuses and we’re actually getting ready to bring those two campuses together into one new building, because the building we found just happens to be in the middle and it’s going to give us a lot of space for growth. So that will happen later on this year when our construction is finished. Rich – Tell us about your role there, what is your role at Mosaic? Phil – My title is called Executive Pastor of Leadership and Development. Phil – You’ll notice it’s not Leadership Development, it’s Leadership and Development and that’s important because the focus is certainly… about half my time is spent on Leadership Development, which is with our staff, with our elders, building our Eldership Program; 27 elders in process right now to become elder/pastors Then the other side is the development side, which is really kind of project management. So if we’re re-launching our brand or re-launching a website, I’m probably going to drive that team, hire the people that we’re doing outsourcing with and a mix of teams members and outsourced in our Capital Campaign that we did last fall, kind of brought together the team of mostly staff and then we hired [Inaudible 00:03:24] to work with us in that. In our building project I’m bringing together the key stakeholders from the different departments to make sure that kids’ ministry area is being designed well and that they’re talking to the architect about what they need and just bringing all of those pieces together. So kind of large projects. So there’s a portion of my job each week is going to be with people, probably half my week is with people, really the staff members and key leaders. Then the other half is going to be spent on what’s the big thing we’re working on right now. So I love that because my job constantly changes, I get bored really easily. So it’s nice to be able to just kind of continually change and also be the one who decides what is the next project that we’re going to work on. So because I am in that second chair role, I get to be the one who says, “Hey, in order to bring the vision into reality, this is what we need to focus our time on next,” and that’s a lot of fun for me. Rich – Yeah, it sounds really like you really live at the intersection of vision and reality right? How do we convert ideas and make them into reality? Let’s dig into that a little bit, hear a little bit more about that and then specifically what does that look like for you? 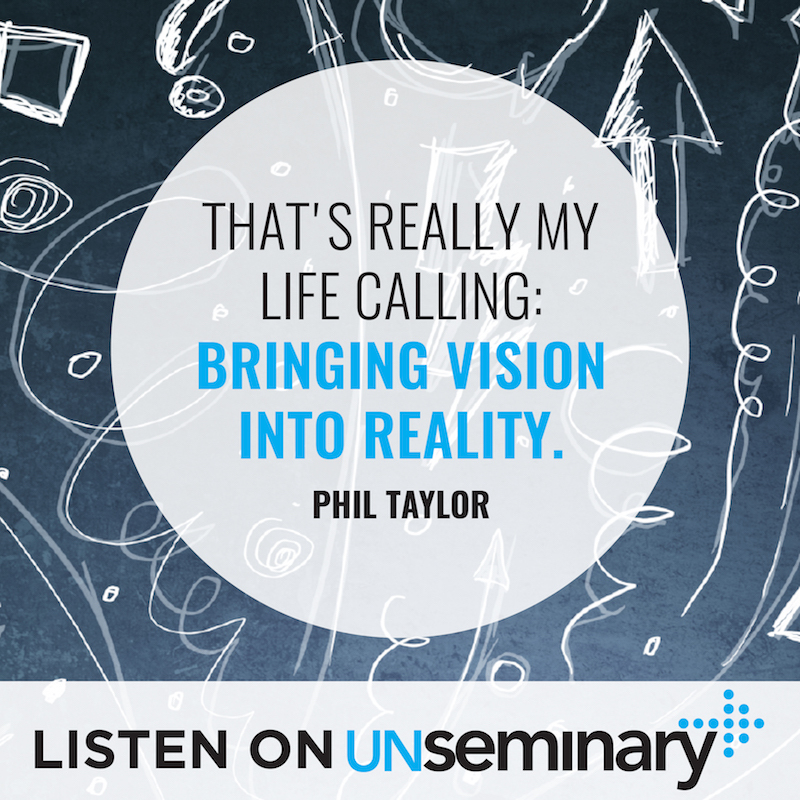 How is it that you are helping that vision come to reality in your church? So what that looks like in our church context is that I’m capturing the vision of our Lead Pastor and really internalizing it so that it’s as clear to me as it is to him and if someone comes to me and says, “Hey, what’s the vision of our church?” I can articulate it just as well as our Lead Pastor can and maybe even in a different way for the people who don’t think like a, in the clouds kind of guy. So it’s that and then saying, “Okay this is the vision, how are we going to bring that into reality?” I’ll give you an example, when I got to our church here, a little under three years ago, I asked our Lead Pastor lots of questions, but one of the questions I asked was just, “Hey, what are some of the biggest pain points in the church right now? What are the crying needs of the church?” He said, “Man, if we don’t get leadership development right, like very soon, it’s going to sink us, because we’ve grown too fast and we don’t have the depth of leadership that we need.” So I said, “Great, okay.” That’s really all he said on that point, there was nothing else said on that point. Then over the next couple of years I began putting that into motion and we’ve not got a leadership pipeline in place that just has a constant stream of leaders coming on line and what it’s done is, it’s expanded our ability to shepherd the church well and that’s really the goal, that we want to be able to shepherd the people who come to Mosaic really, really well and that requires training up a ton of shepherds. Phil – I think you just hit on a really important point there which is, the Lead Pastor walks into a room and says, “We’re going to do this awesome thing,” and if that time that he says that is the first time that the Executive Pastor is hearing about it, you have a major problem with communication between your Lead Pastor and your Executive Pastor. Either the LP doesn’t trust the XP or the XP is not gifted well enough for that role or inappropriately for that role. So my Lead Pastor and I, we meet every week for at least an hour. One week it will be with our full executive team, the next week it will be just he and I. Sometimes it’s a two hour meeting where we can dig into life a little bit more, but in those times I’m always asking him, “Hey, what is God speaking to you? What are the new visions that you feel like God’s giving you for the church? Are there things that you’re seeing?” and then we’re talking about that. Phil – “Now you guys go and make it happen.” No that’s not the way we do things. It’s the way our church used to do things. Phil – It’s not the way we do things anymore. So now he’s going to come to me and say, “Hey, I’ve got this idea, I don’t know, what do you think?” and then I’m either going to say, “Yeah, we can do that now or it might be better to wait six months or you know what, we probably shouldn’t do that at all actually. We’re just not going to do that one,” and he’s going to submit to me, just like I submit to him and occasionally he’s going to say, “No man, I really want to do this.” But the important point is we’re talking ahead of time. Phil – But then when we walk into a room, a director’s meeting or an all staff meeting and say, “Here’s an idea that we’re just starting to poke around into,” he and I have already put some flesh on those bones. We might have been talking about it for three months. I might have already put together some rough guidelines on how we’re going to bring that vision into reality. I might have already brought that to our Executive Director of Operations and said, “Hey, what do you think this is going to cost? Is it going to require another staff member? Is it going to require a $50 thousand allocation in our budget? Is it going to require $1 million allocation in our budget? What is this going to cost from a payroll standpoint, from a volunteer standpoint? How is it going to distract our team? Does that mean we do it now? Does that mean we wait until we get through this building project?” So you see what I’m saying? Phil – And that’s really the importance of the LP/XP team, especially in larger environments. Rich – Absolutely, I’ve heard in the past and I’ve seen this just as I’ve interacted with my Lead Pastor, there is this kind of long slow hunch that sometimes it takes a long time for ideas to germinate and then there’s kind of a tipping point where they go from like, “That’s an interesting idea,” to, “Yes, let’s do that.” What I hear you saying I just want to encourage and underline is a part of the role of the Executive Pastor and Lead Pastor is to be in dialog through those long slow hunches, so when it gets to the like, “No, I think this is where God’s leading us to go next,” that it’s not the first time that we’ve talked about it, that we’ve been able to process those together. Rich – How else have you built trust between you, obviously trust relationships are super important between Lead Pastor and Executive Pastor? What would you say to an Executive Pastor today that’s listening in that’s saying, “Hey, I need to work harder on building trust, going both ways, with my Lead Pastor? What does that look like for you? Phil – Well you can turn to any marriage book and get some good tips on this right? Phil – I mean, to be honest, if you’re not spending enough time with your wife, she’s going to be more likely to wonder what’s going on right? So a lot of these things are very similar. That’s why I meet with our Lead Pastor every week, we meet every week and I think time is the key. We’re meeting together every week, we’re talking about stuff, there’s not a whole lot of secrets between us, do you know what I mean? Where if there’s something going on with my kids or with my wife, like I’m sharing that with him and vice versa. We’re really sharing each other’s lives together. We go out on double dates, my wife and his wife, the four of us, we go out on double dates probably 3, 4, 5 times a year. We’re connecting throughout the week, just kind of staying in contact all the time. But then a great way to build trust is from the XP to LP, a great way to build trust is to keep a running list of things that you just need to keep him informed of. So I’m a big Wunderlist guy and one of the lists in my Wunderlist App just has our Lead Pastor’s initials on it. Anytime there’s something that comes up and I’m like, “Oh, I need to let Renaut know about that,” our Lead Pastor, his name is Renaut. I’ll just drop that in that list and then in our next meeting I’ll just kind of check off, “Hey, just so you know, this is going on with this staff member. FYI, I dealt with this fire that we had to put out over here. It’s all taken care of but I wanted you to be aware of it.” Or, “Hey, the building project’s getting slowed down by two weeks because of this.” I’m just kind of constantly keeping him in loop, so that when somebody comes to him in the lobby and asks him a question, he’s not caught flat-footed right? Phil – So he feels like I’m really keeping him in loop on things. Even though, for all intense and purposes, I’m the one that’s running the church, do you know what I mean? He’s preaching and casting vision and I’m running the church, but he’s always informed. So that’s a really big one and then from the other direction, from the LP to the XP direction, building trust with me, because that’s just as important for me, is that again, we’ve got an open dialog and he’s informing me of things, but what I’ve found is that because I’m the more organized guy, I have to kind of pull it out of him. When I sit with him I’ll say, “Hey, have you had any meetings over the last week that I need to know about? Are there any conversations that you’ve had with people that would be helpful for me to know about?” And I’ll kind of pull that out of him and that’s super helpful for kind of just creating trust between us. It was easy, quick, you know? But that builds trust, like we just talk about it. Phil – We just talk about it, you know? Rich – Right, exactly. Yeah, don’t go underground, don’t harbor any of those issues, short accounts for sure, definitely. Rich – Let’s change tack a little bit. When we talk about, a bit part of an Executive Pastor role is really the team development side of it and obviously you’ve talked about that, that’s really a big piece of what you do, leadership development staff and otherwise. When you think about getting the right people on the team, getting the right people on the bus and really putting them to work to implement the vision, what would you share as some best practices from that point of view? Obviously there’s a lot there, getting the right team members and making sure that they’re positioned in the right place. Phil – Well, I think culture fit is probably the most important thing. Culture fit is huge, so I think the trend in a lot of younger churches and newer churches is to hire from within. There was just a report, I think that Warren Berg did on hiring practices and it showed that younger, newer church plants tended to hire from within more than going outside. So we try to have most of our people that we’re bringing into leadership roles, staff roles, be people that we’re hiring from within the church. That may mean that they lack some of the educational credentials that another staff might have. They might have been homegrown. The only theological development they might have had happened at your church, but the benefit there is that they really get your culture, they’re passionate about your church culture and so they, kind of, already want to die for your church. They already are bought in. Now interestingly, I was the first guy in the church, staff that was hired from outside, like in 13 years. When I came here the staff was already 35 people. Phil – I was literally the first guy who was brought in from outside the church. So that was kind of a weird thing for the rest of the team to figure out like, “Here’s this outsider, he’s telling us what to do,” so we had to kind of navigate that for a while, but I won them over and showed them that I loved the church just as much as they do. So I think hiring from within is important. When you do hire from without you’ve got to make sure that, as much as possible there’s vision alignment, there’s DNA alignment, there’s even some intangible things. We just hired a new Worship Pastor and of course, we didn’t have a guy inside that we thought was going to be the right fit and so we did the national search thing, I chose not to hire a search firm for this one because I felt like I had enough contacts and leveraged a contact at Austin Stone Church in Texas and asked those guys if they had anybody that we ought to take a look at. We’re in the same network of churches, X29 Network, and so the Worship Pastor there gave me a guy, he said, “Hey, I think you ought to take a look at this guy,” and as we started talking we found out that he actually used to live in the same town as our church. Phil – His in-laws lived in the next town over. Phil – So it kind of just created this kind of really natural thing where, even though he hadn’t grown up in our church, he hadn’t been trained up in our church, he had all these natural connections to our area. So we’re always trying to look for those natural connections. Before moving here from Upstate New York, I loved Orlando, I was passionate about the city of Orlando a decade before moving here, so for me, coming to Orlando was like, “Of course, I’d love to come to Orlando,” right? Phil – So again, you’re just looking for things that are going to make it a natural fit because hiring and firing is an expensive proposition. Phil – Whether it’s paying somebody who’s not being effective, whether it’s going through and hiring a search firm and paying them a third of a salary for the first year, it’s an expensive process. So the more you can get it right, it’s going to be cheaper for the church which makes us better stewards, and it’s going to be better for the team because it creates stability. Rich – Do you have a rule of thumb around hiring internal or external? What was it about, is it just, “Hey, there’s isn’t a candidate internally,” that kind of flipped the switch to hire you externally? Have you seen anything around culture development on hiring internally or externally? Phil – I think you have to play the cards that you’re dealt. So when you’ve got a role, you look around at your internal team first and you say, “Is there somebody who is going to be an 80% effective fit for this job inside the church?” They may be already on your staff and you’re going to transition them. They may be a lay person. You’re at Liquid Church right? Phil – So you guys are a larger church, you probably experience the same thing that we do, where if you’re a larger church in town, every pastor who is kind of burned out, like ends up at your doorstep. Phil – And shows up at one of your services and some of them you end up hiring right? So sometimes it’s kind of a mix of homegrown and he was a pastor somewhere else and then he showed up with us and he was whatever, working another job for two years. Phil – We realized we really liked this guy and he would make a great campus pastor. That was actually a story we did last year, where we hired, who had kind of showed up at our doorstep and ended up being a great staff member for us. Phil – I think it’s important to have both. I think it’s helpful to have both. Rich – Yeah definitely. In the past I’ve used the rule of thumb that hiring internally really does ensure stability, so if you want to continue to stabilize the ministry area, internal hires do that. Rich – External hires are really positive when you want to radically shift a particular area in your ministry. Phil – Shake it up. Rich – Right, “We are hiring you to change this piece and we need you to bring that in.” Well this has been a great conversation so far. Just kind of as we pivot, two last questions before we jump into the Lightning Round, you’ve actually written a book called Finding the Executive Pastor Role. Can you tell us a little bit about that? Phil – Sure. When God kind of called me out of my Lead Pastor role into the Executive Pastor role, almost instantly I really felt like, “Gosh, I want to create more resources for Executive Pastors.” So I started digging into this role and I realized there was like two books for Executive Pastors, right? So I just started taking notes on a lot of things and began to develop some writings. So this is the first book in a five part series actually. So it’ called, The Backstage Pastors Series. The first one is really kind of on, kind of razor sharp focused on defining the role. It’s a hundred pages long, so it’s a quick read and it’s designed to really feel like we’re just kind of sitting there having a cup of coffee together. The next one will be on the Lead Pastor and Executive Pastor relationship. So again it will just be super focused on that. I’m about half way through that book right now. That should come out this year. Phil – The next two are going to be The Executive Pastor and His Team and then the last one, I’m not sure of the exact order that I’ll write them all in but, one of them is going to be, The Executive Pastor and His Soul, and really kind of dealing with some of the unique soul issues that are different maybe for an Executive Pastor than they might be for a Lead Pastor. We’re going to struggle with different sin issues I think, we’re going to struggle with different pride issues, we’re going to struggle with different idols, so that will kind of focus in on that. I’m not quite sure I’m ready to write that one yet, that will take some time. Phil – Yeah, I’m excited to kind of poke away at this series over the next few years.